How do I project a playlist? Save your playlist to a project, and export the project to an SD card using the Epson Projector Content Manager software (Windows only). Note: See the Epson Projector Content Manager Operation Guide for more information. Insert the SD card in the projector. Follow the steps in one of the sections below to project. To select a playlist from a displayed list, press the SD Viewer button. Then select the playlist you want to project. To project the playlist on the SD card that was played last, press the SD button. Note: If you created a timetable, the playlist will play back according to the schedule in the timetable. To project a specific playlist assigned to a favorite playlist's button, press the corresponding button on the remote control. Note: You can assign playlists to each of the number buttons (1 to 9) on the remote control using the Epson Projector Content Manager software, a web browser, or the Epson iProjection app. Note: Make sure you have installed the latest version of the Epson iProjection app on your mobile device. Make sure the projector is on and connected to the same network as your mobile device. Start the Epson iProjection app and select your projector to connect to it. Tap > Remote > Playlists. Select the playlist you want to project. Make sure the projector is on and connected to the network. Start your web browser on a computer or device connected to the same network. Enter the projector's IP address in the browser's address bar and press the Enter key. Note: If you attempt to connect to the Epson Web Control screen via a proxy server, the screen will not be displayed. 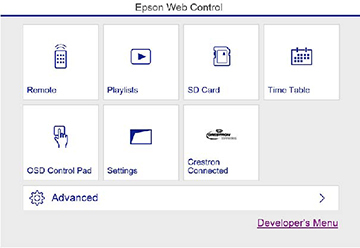 Make a direct connection to the Epson Web Control screen.